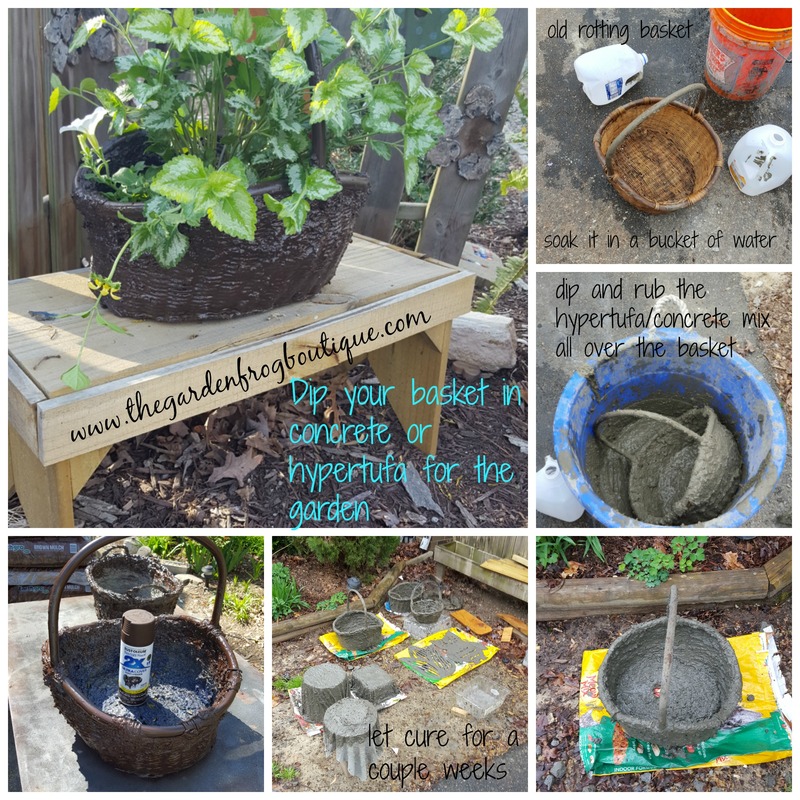 Dip your wicker basket in hypertufa concrete for the garden. Why? Well if you are like me I like how potted plants looks in baskets sitting in the garden and even on the deck. But there is a problem with this- the baskets rot after a season and then you throw it away. I have been known to get a 2nd season out of the rotting basket by sitting it in the garden on the ground and trying to remember never to pick up the basket (to avoid the ‘dammit’ the bottom fell out incident). I thought to myself ‘why can’t I dip these in hypertufa concrete?’ So with the wheels turning in my head, I decided to dip 3 of my baskets from the garden a few weeks ago. The basket pictured above, is my favorite $1 basket I got a couple years ago at a yard sale. How do I know it was a $1? 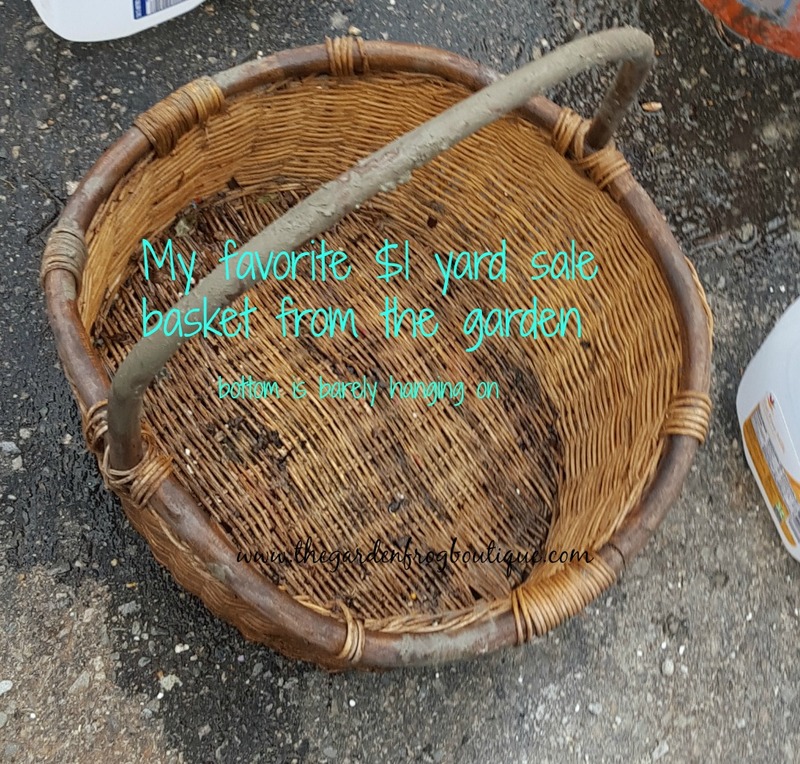 Because I never spend more than a $1 for a basket in the garden. What you cannot tell in the picture is that the bottom was barely hanging on. 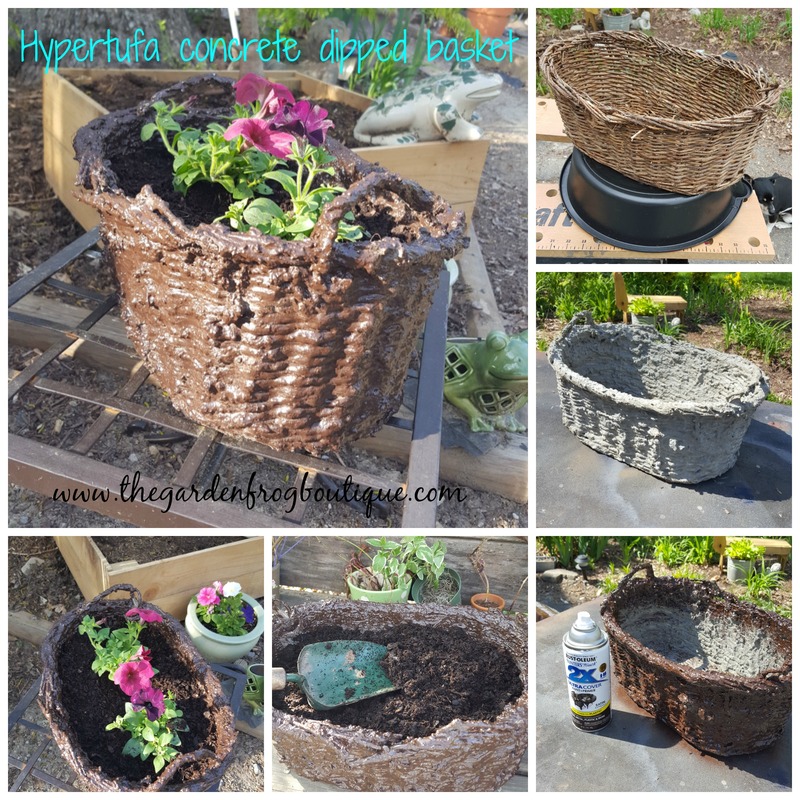 So I made up a very runny hypertufa mix, first soaking the basket in the bucket of water (you must soak the baskets in water so the wicker will absorb the hypertufa concrete mix); then I dipped the basket in the big tub and smothered the hypertufa mix all over the basket. I tried to the do the twig handles but I knew that the mix was not going to stay on the handles so I wiped it off the handles and just did the wicker bottom and sides. What is great about doing this? The basket still looks like a basket and I was able to put the frail wicker basket together. I will tell you- it took some careful handling to get the basket covered in hypertufa mix, lift it out of the big tub, and place it in the ‘curing’ area. 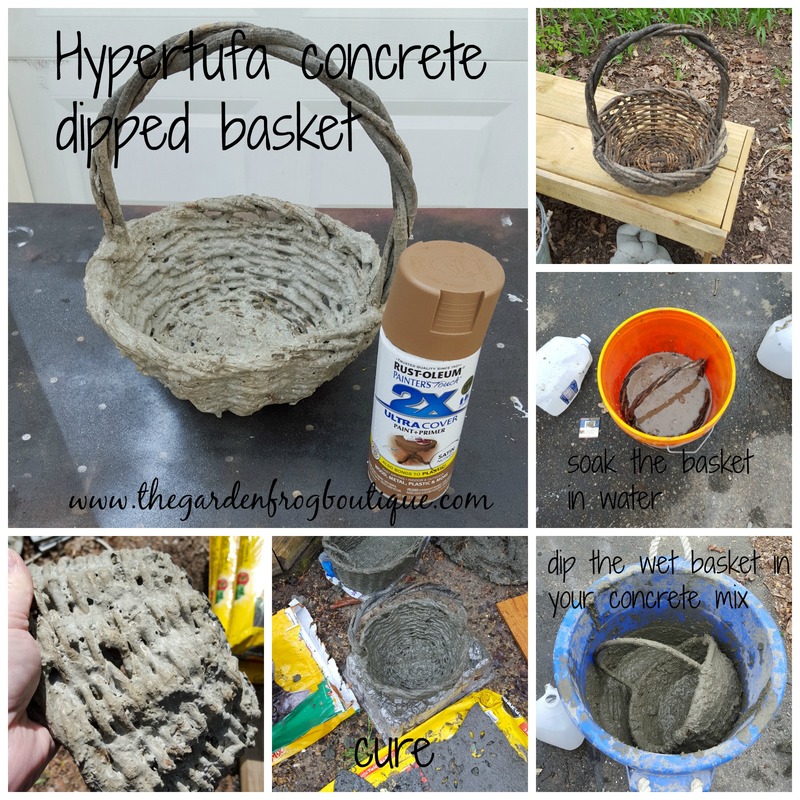 I let the dipped hypertufa concrete baskets cure for a month. I have to confess here that I do not cover them in plastic or even put them in garbage bags to cure as described by other bloggers. I put them in the shade and let them cure. You do not want the hypertufa or concrete to dry but to cure- which means you may want to cover them and keep them out of direct sun for at least a month. I sprinkle the pieces with water when I am watering my plants but I have never taken extra steps and so far I have not had any issues. 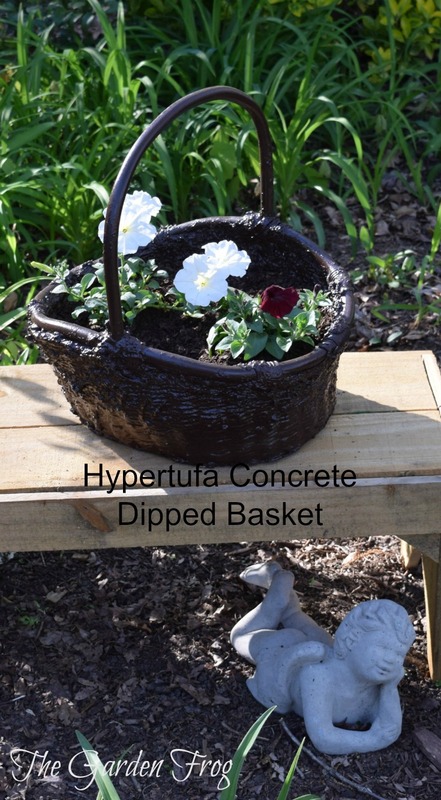 Well after this season, because this is fairly new project, I will know how well the dipped hypertufa concrete baskets do (but I will add that they have seen drastic changes in temperature this spring while curing and have held together). 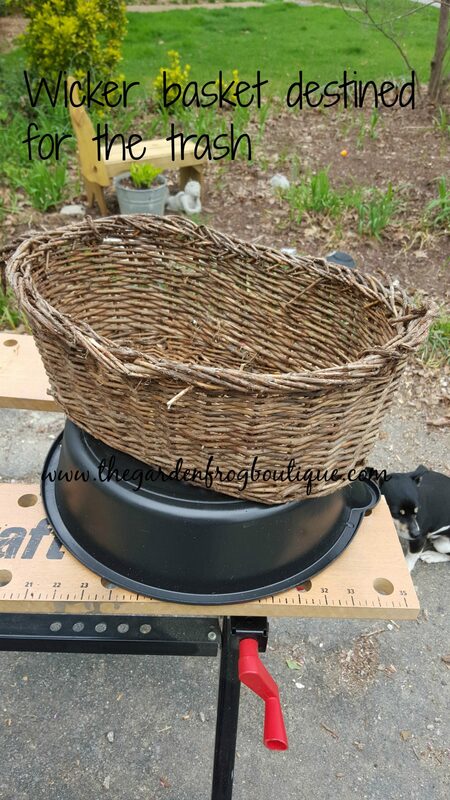 I also know that I will be hunting for more baskets this spring at garage sales to make more planters for my garden. What I will do different? I will just mix up a very runny mixture of portland cement not hypertufa so I have more of a smooth finish. I have other garden projects too that you can check out that I have made out of concrete and hypertufa. Thanks for stopping by and I hope I have inspired you in the garden! If you ever want to ask me a question, feel free to contact me. Have fun and happy gardening. I do not know how long they will hold up but I would bring them during the winter so they do not have a chance to freeze and thaw during the winter months. And do not pick up by the handles either! What a great idea. I have not tried hypertufa but hope to do so this summer. Have ya yet tried the super runny portand and just submerging the handle into the mix? What a creative idea! 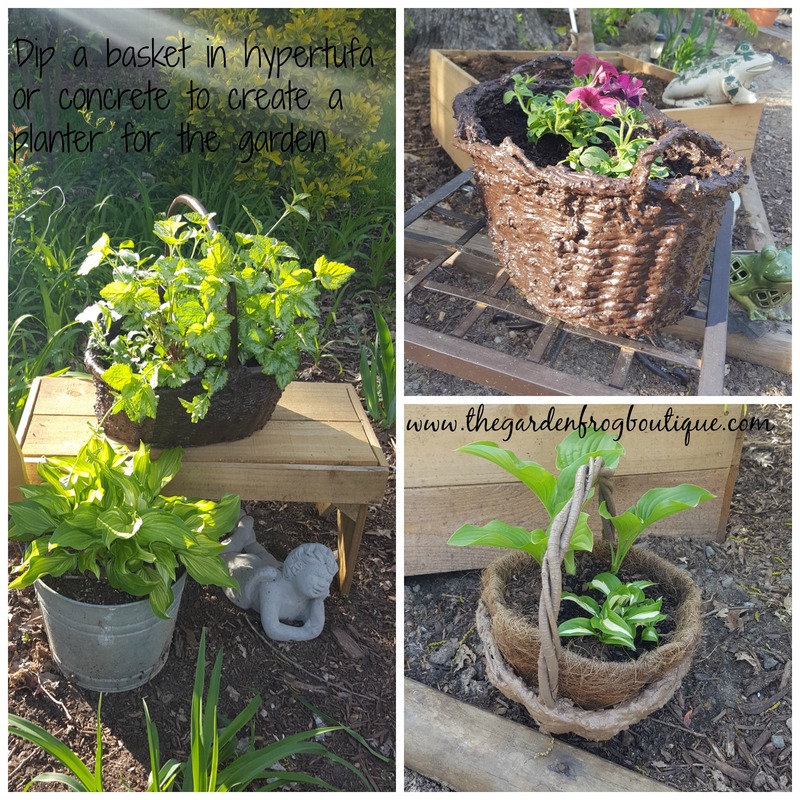 I love to use baskets in my garden and this is an inspired idea to save them for a few seasons. If I did not plant directly in them but use them as holders for plastic planters I could switch around the plants each season. Seriously going to try this! Thank you for stopping! I love using baskets too and I do switch them out with pots and so now the concrete dipped ones should last at least 2-3 seasons or more if I put them away in the winter. Happy gardening! I will be interested to see how these hold up – winter where I am is super hard on planters, you wouldn’t believe how many I lose, because I’m terrible at bringing them inside! I have never tried hyptertufa but plan on doing some this summer. Great post!